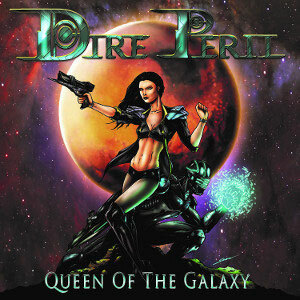 California Science-Fiction Power Metal act DIRE PERIL will release their second EP “Queen Of The Galaxy” on September 26th, 2014 through DEAD INSIDE RECORDS, following up a self-released their debut EP “Astronomical Minds” (2012) which got rave reviews from both fans and critics around the world. 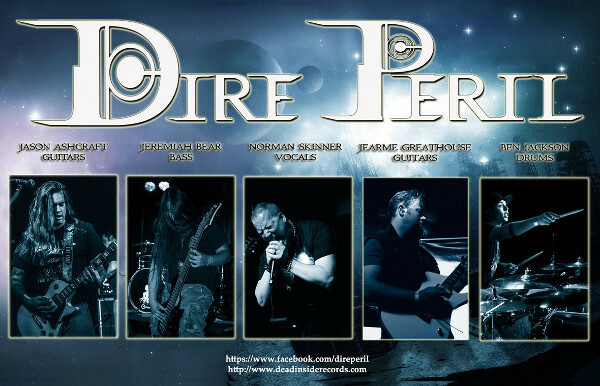 The band was formed in 2009 by guitarist Jason Ashcraft with his interesting idea of a combination of his love for Metal music and science-fiction. Vocals for the album were tracked by Norman Skinner (Ex-Imagika, Skinner, Hellscream) at Savage Screams Studios in Fremont, CA. and the remainder of the album was recorded at Alien Productions in Carmichael, CA. Mixed & mastered by JK Northrup (XYZ, Liberty n’ Justice). As the additional lead guitarist, Jearme Greathouse joined in the band, who is a veteran of the Northern California Metal scene. As a Special guest musicians, Brittney Hayes (Unleash The Archers) takes on the duties of lead vocals for the title track “Queen Of The Galaxy” and guitarist Tony Cordisco (Judicator) also makes an appearance on the track “Space Invaders”. Cover artwork for the album was created by Horror/Fantasy artist Sean “Zombie” Walusko.